“Flicker” by Kaye Thornbrugh – Review + Interview + GIVEAWAY! When sixteen-year-old Lee Capren is spirited away to Faerie, she is forced to serve capricious faeries as a prized portrait artist… and live as their prisoner. A chance encounter with the charming Nasser grants Lee a chance for freedom—but what felt like mere days in Faerie spanned years in the human world, and Lee no longer has a home to return to. Nasser is a Seer—a human with magical powers—and Lee is quickly plunged into his world: a sprawling city teeming with magic and mystery, where supernatural creatures walk hidden among humans. With the help of a rag-tag group of teenage Seers, Lee must master her newfound magical talent and outwit a cunning faerie determined to destroy her. 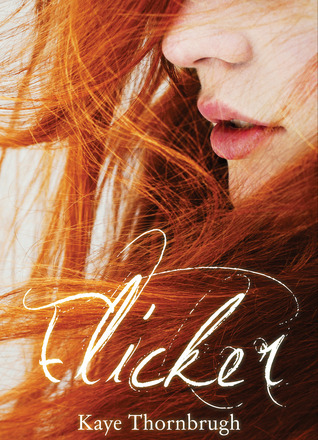 I will readily admit that Flicker is not the kind of book I would pick up at first glance. For reasons of personal preference, I don’t often read books about fairies. However, when Ms. Thornbrugh contacted me about reading her novel, I was intrigued enough to say yes. Actually, the book got off to a fairly rocky start with me. It opens up with Lee worrying about very cliché things I see in almost every single teen novel where the MC goes to some form of high school, where the main character is the loner type losing her best friend to the lust for popularity. Lee’s best friend, Kendall, was fairly stock and not overly interesting. I could already see several cliché plotlines coming up. And then Thornbrugh went and blew them all away. Anything cliché about this book disappeared after Nasser rescues Lee from Faerie. One of the things that hit me instantly was the quality of all the characters after that fact. Nasser, Lee, Nasser’s brother Jason and their friends Filo and Alice are all interesting, real people with depth and a definite 3D nature. Even the background characters had layers to them. This is hardly a common occurence in teen lit, and it made me practically overjoyed. However, that transition into all these new characters wasn’t entirely painless. The rest of the novel is told from several points of view, and directly after Lee is rescued from Faerie they are a little squashed together. Four or five POVs literally switch within paragraphs of each other. Though there are clear paragraph breaks, it was almost a little bit too much to handle, especially because we hadn’t been introduced to all these characters yet, or even know why they existed at all. Still, after that transition evens out at the POVs stop switching so quickly, it settles into being a really enjoyable read. Another thing that struck me was that there wasn’t just one thing going on. Sometimes in teen lit, you have one plot where the characters are trying to get from point A to point B and they go there in a straight line, with everything they do pertaining in some way to that goal. Thornbrugh had legitimate subplots and side adventures, which helped not only give other characters depth, but also keep the story moving without pause while continually being interesting. I also tip my hat to her for the romance. While Nasser and Lee didn’t exactly have a huge base on which to begin their relationship, they felt real to me. Also, with so much going on, there wasn’t an overly large amount of time dedicated to their relationship, which was nice. I’m all for romance, but I don’t like when it is THE focal point of a story. Nasser and Lee were just two people who ended up falling in love in the midst of several bigger conflicts. My favorite kind. I did, however, dock a few points for some subplot holes that didn’t make sense, but they weren’t numerous and really don’t matter to the overall plot. They were just me being nitpicky because of Thornbrugh’s excellent writing up until that point. It should be mentioned that Thornbrugh is a very descriptive writing. Some people like this, some people don’t–in fact, I usually don’t. I prefer the book to move as fast as possible at all times. However, with the emphasis put on magic and art, I found her lyrical and descriptive prose to be the perfect way to tell the story, and it didn’t really bog down anything all that much. Overall, Flicker was a definite love for me. It had plenty of action, magic and gorgeous description, as well as a FANTASTIC group of characters that made me so happy at every page. There was romance, but not an overly large amount, but it felt real the way that it happened–two pluses for me. I’ve seen this book on a couple of “maybe” lists on Goodreads, but in my personal opinion it should be on some “definitely read” lists! It certainly is going on my “recommended” one! Now, everybody give a big hand to welcome the author, Kaye Thornbrugh! What inspired the creation of Flicker? faerie novels had left in my mind: Most stories deal with someone rescuing a loved one from Faerie—but what about the person being rescued? How would they cope with their time in Faerie, and how would they change once they returned to the normal world? I wanted to tell a faerie story from that perspective—and that’s where the idea for Flicker’s heroine, Lee, and her journey, came from. Why, in one sentence, should someone read Flicker? It’s a different kind of faerie tale. Flicker has one of the best character casts I’ve read in a while. How did you go about creating them? Did you base any of the characters off real people or yourself? Many of my friends ask me if my characters are based off real people—I’m never sure if they’re secretly hoping they turned up in one of my books, or if they’re afraid that a less-than-wonderful character was based on them! Either way, they’re usually surprised when I tell them that all of my characters are completely fictional. For me, the most important part of creating characters is making sure that I’m choosing the right person for the job—or, rather, the role in the story. Characters have to earn their places in the story by being both the most appropriate person for the role I assign them, and the most inappropriate person. It might seem contrary, but it works for me. I try to make sure my characters are 1) relevant to the situation and have a good reason for being there, and 2) also experience some kind of conflict or struggle—great or small, internal or external—after being pulled into the story. It helps to keep things interesting! A love of stories—it’s really as simple as that. I’ve loved coming up with my own stories for about as long as I’ve loved reading; I took my first “serious” stab at writing (a kind of ridiculous story about a werewolf hunter) when I was nine. As a storyteller, it’s my responsibility to entertain my readers, and I take that very seriously. To me, few things are more rewarding than writing a story—be it fiction, like Flicker, or an article for my college newspaper—that captures somebody’s attention and imagination, and gives them some enjoyment. Now, I know you’re a big fan of fairies, but what is your other favorite YA trend: mermaids, vampires or angels? Or do you run away from books containing all three? Vampires and angels have never been my preferred trends—I’m more of a werewolf and demon fan, to be honest—so right now, I’d have to go with mermaids. I know they’re cropping up more and more in YA, but I’m a bit behind on my reading list, so I don’t feel like they’ve been done to death yet! I’m also always eager to read something with creatures outside the typical fantasy/paranormal bag of tricks. For example, Patricia Briggs’ most recent Mercy Thompson novel, River Marked (not YA, but one of my favorite books! ), includes spirits and monsters from Native American folklore. Excellent stuff! NOW HERE’S WHAT YOU’VE ALL BEEN WAITING FOR: GIVEAWAY TIME! Kaye is SO AWESOME she’s offering one SIGNED physical copy of Flicker, one bookmark AND a CD of the Flicker soundtrack. Isn’t that awesome? Please note this giveaway is US only and ends at 11:59 PM on August 30th. Click HERE to enter!